The move to solar generated electricity has been long awaited. Puredrive Energy (based at Toddington) have just released there flagship product Pure Storage – a home battery storage system with a 4.8 Kilowatt hour capacity, specifically designed for the UK home market. This means that solar energy that is generated during the day on existing and new solar panel installations can be stored and used at night when it is usually required rather than in the day when generation takes place. 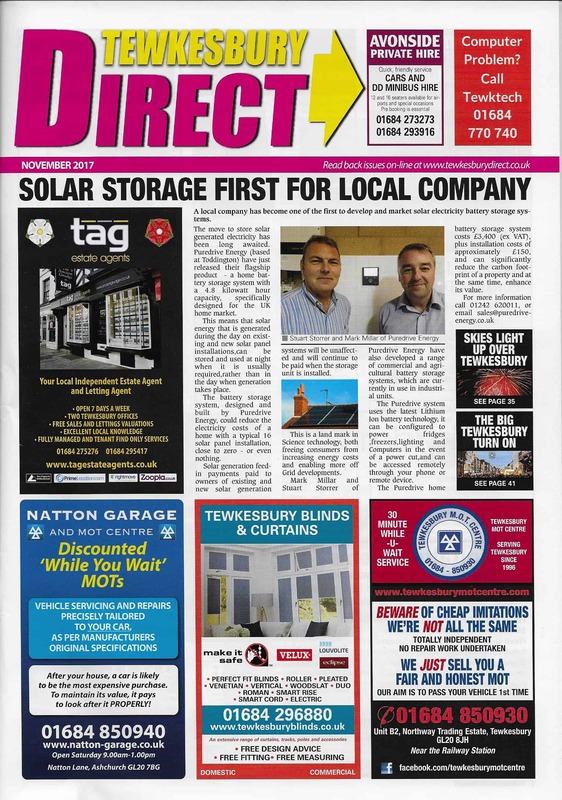 The battery solar storage system designed and built by Puredrive Energy, could reduce the electricity costs of a home with a typical 16 solar panel installation close to zero or even nothing. Solar generation feed-in payments paid to owners of existing and new solar generation systems will be unaffected and will continue to be paid when the storage unit is installed. This is a land mark in science technology, both freeing consumers from increasing energy costs and enabling more off grid developments.Mark Millar and Stuart Storrer of Puredrive Energy have also developed a range of commercial and agricultural battery storage systems which are currently in use in industrial units. The Puredrive solar storage system uses the latest Lithium Ion LiFePo4 battery technology and it can be configured to power fridges, freezers, lighting and computers in the event of a power cut and can be accessed remotely through your phone or remote device. The Puredrive home battery storage system costs £3400 (Ex Vat) plus installations costs of approximately £150 and can significantly reduce the carbon footprint of a property and at the same time enhance its value.